The American Mosaic is a 4-credit, intensive community studies and field research immersion in the multi-ethnic community of Steelton, PA.
Students will be actively engaged in field work, community service, and social learning. They will apply the theoretical and methodological skills that they develop early in the semester to real-life histories of Steelton workers and residents. We will make a comparative study of migration, family, and work narratives, particularly as these are articulated by members of the local African American community. 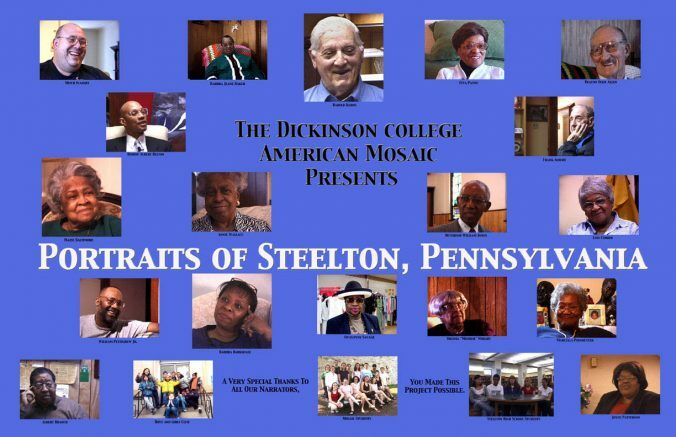 The 2001 Mosaic is the second community-college collaboration between Dickinson students and the Steelton community. Students will document aspects of work, family, religious life, ethnic and racial relations, and political struggles for the Steelton community. Students will also integrate new technologies in an exhibit that may involve audio and video documentaries, photo essays, archival records, CD roms and web pages, and performance, as well as written analyses.